We have approximately 25 of these 100W High Bays left over from 2 church gymnasium projects. They originally sold for over $400 but since they are now discontinued we need to get them out of our inventory and are offering them for $99.00 each. If your company needs some lighting in a 20 Ft (approx) ceiling area this is a great deal. 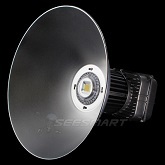 Each 100W LED High Bay come with a 60 degree aluminum cone and has a 5 year manufacturers warranty.